In general, identifying the muskellunge from the hybrid is fairly easy, though it can be more difficult with some individuals. The tiger muskie is named for the prominent light-colored, branching bars on a dark blue-green background; some of the light-colored pattern continues across the back. Muskellunge, on the other hand, have much less prominent, non-branching, dark bars on an olive to tan background with no pattern across the back. 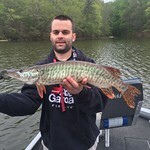 Muskies are not native to Maryland and currently occur only in the Washington County portion of the Potomac River. The original source of these muskies remains unclear. Muskellunge/Tiger muskie use a variety of habitats seasonally from deep open water to shallow cover such as weeds and fallen trees. In rivers, they usually occupy the deeper pools with reduced current. The muskellunge population was expanding coincidentally with our tiger muskie program and many of the adult muskellunge were misidentified as hybrids. Though an occasional adult muskie was observed during the late '80s, the first documentation of natural reproduction occurred in 1996, when the picture became clearer after several young-of-year were collected and natural reproduction was documented. Spawning takes place near aquatic vegetation, debris, and leaf litter over a period of a few days. The eggs are broadcast over a fairly large area and settle to the bottom. Tackle for muskie needs to be stouter than tackle used for bass and walleye. Several tools are needed to make releasing muskies safer for both the fish and the fishermen. Foremost is a large needle-nose pliers or a hook-out (pistol grip pliers) for removing hooks while keeping fingers a safe distance away from their teeth. For more information or a handout of release procedures and tips, contact the Lewistown Work Center at 301-898-9724 or John Mullican. For more information visit the Maryland Muskellunge Program website. ​For more information on tiger muskie and their management, please contact John Mullican.